Brewery Chillers – TEMPEST, Inc. Most brewery chillers require glycol, which is a food grade anti-freeze, because they run at temperatures below 32°F, hence, they are also called brewery glycol chillers. 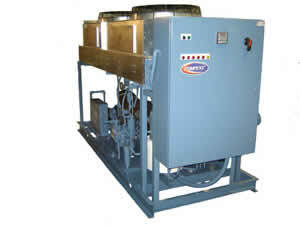 Glycol chillers are installed outdoors in an all in one type design. There are two main kinds of brewery glycol chillers, the modular brewery chiller and the split brewery chiller. The modular brewery chiller is used as a booster chiller if the brewery already has a tank and pump, or if the existing chiller is not functioning adequately for the needs of the brewery. This kind of chiller has no tank or pump. The split brewery chiller can be used if the chiller unit is on the roof. Because it is used when the tank or pump or heat exchanger are in separate cabinets, it is possible for this chiller to be located indoors, or at an easily accessible location for maintenance. This is basically an indoor chiller with an outdoor condensing unit. Most brewery chillers come with remote control panels for indoor installation and for easy operation. Before you buy a brewery chiller, make sure to purchase a system that would be suitable for your applications, making sure the chiller being purchased can operate at the temperatures you require. Also, check the power requirements of the chiller to match the power supply of the building in which it is to be used. Brewery chillers can come in a variety of configurations, some offered as a packaged system and others as separate components. That means certain chiller configurations may work better for a given application depending on the amount of available space. Lastly, it is not advisable to purchase a brewery chiller that has been in use for more that 10 years due to the reduced reliability of the system. With these considerations in mind, you can find a brewery chiller that satisfies your application requirements and fits within your budget. Brewery Chillers Brewery chillers as their name would suggest are used in the process of brewing beer. Typically, this type of chiller is used in the cold crashing and fermentation of beer, and they usually circulate 28°F degree glycol for 33°F degree beer.